Starting the burn with a propane torch. If you own a house, you know how bad dry rot can be for the integrity of your structure. Imagine you live in a cabin built on a float of cedar logs. Cedar is the most durable wood for construction. It is slow to saturate, making it a perfect choice for float structures. But all wood deteriorates over time, even cedar. On a cabin’s float, the most exposed logs are the ends of the brow logs. They are the cross members on top of the float logs which are partially submerged. If you lose a brow log, you weaken the steel cables that tie all of the logs together. So goes the foundation, so goes the home. Monitoring the burn with water buckets and extinguisher handy. Pinpointing the burn sites to remove all dry rot. One end of our central brow log has been subject to dry rot. We need to catch it before it becomes too advanced. The solution is burning. It seems like an extremely dangerous solution, but it’s very effective. You burn out the rot much like a dentist drills out a cavity. Once you get down to good wood, you stop the burn. You can tell how much based on the intensity of the flame. The charred wood then acts like a natural sealant, protecting the good wood from further rot. Our good friend John is what we call an “aquatic engineer.” He’s well versed in these things. John brought his propane torch up to the cabin ready for some log dentistry. Wayne readied buckets of water and a fire extinguisher, just like a good dental assistant. Extinguishing the flames and watching for flare ups. It was really scary to watch the flames lick high under the deck and for such a long time, but a combination of torch application and water splashing controlled the burn. Finally, it was done. Whew! Several applications of water and careful monitoring throughout the day allayed my fears of my home going up in smoke. While he was at it, John took the torch to the ends of the other two brow logs as a preventive treatment. They are even more critical to the integrity of our foundation. It’s always nice having John’s expertise to help us learn the skills needed for off-the-grid living. He’s been a great friend and mentor. 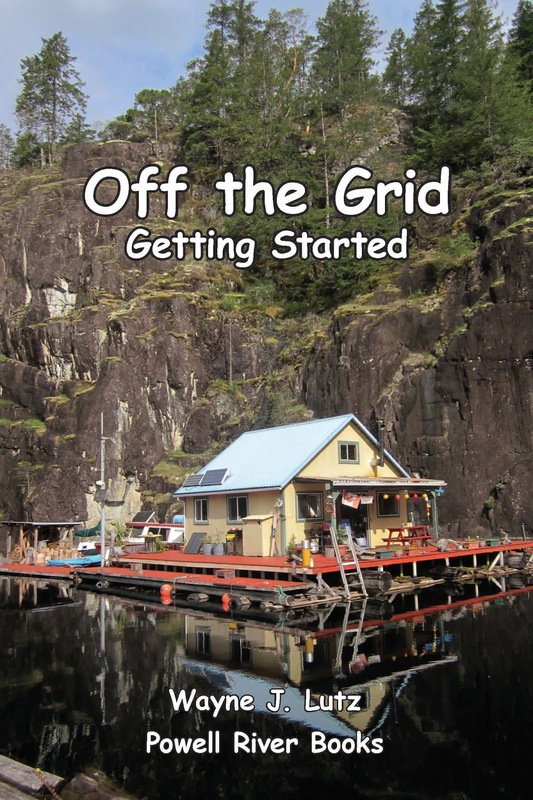 Wayne has written several books about our off-the-grid life in a float cabin. They are available in both print and e-book formats from most online booksellers. Up the Lake – Our discovery of float cabin living. Farther Up the Lake – More cabin life stories. Off the Grid – How we live in a remote water access cabin. The Mourning Cloak butterfly (Nymphalis antiopa) is common throughout the United States and here in British Columbia. It emerges early in the spring when temperatures reach about 10° C. When Wayne and I were out riding our quads in early April, there were everywhere, leading the way along logging roads and trails. The Mourning Cloak is easy to identify because of its large size and dark maroon-brown wings fringed in yellow and a band of bright blue spots. The Mourning Cloak feeds on flowering plants, but it chooses willows, poplars, and similar woody plants to lay its eggs. That way, when the larvae emerge they have their food of choice. After hibernating through the winter, Mourning Cloak butterflies emerge to mate and lay their eggs. At this point, they are about a year old, having overwintered in sheltered locations under logs or forest debris. With the mating ritual complete, their wings become tattered and they die. To me, the life cycle is reminiscent of salmon going upstream to spawn just before their bodies give out. New butterflies emerge from the larva stage in late July and spend a week or more feeding before going into a dormant stage. They emerge again in the fall for another feeding frenzy. It’s probably this lifestyle that allows them to live longer than most other butterflies. Of course we like summer sun, but with the minimal snow pack this year it's nice to have some showers in between. Two weeks ago, I shared how we made a new anchor for our float cabin’s log boom. A 55-gallon barrel, bag of cement, an old boom chain, sand and rocks from the beach, and water from the lake made an inexpensive weight. We used rope to connect to the anchor. John came up to help us with the drop. He chose heavy-duty rope rather than steel cable. It’s debatable which lasts longer. Steel rusts, rope deteriorates when exposed. John got 1 ½ inch Steel-Strength Polypropylene. It’s strong, less expensive, and safer to work with. John laying out the rope for the drop. We needed 200 feet of rope to reach the bottom at 120 feet and swag inward to the log boom. Extra isn’t a problem. Not enough? Well, that’s an expensive mistake. We chose to set the anchor with the water at the mid-point. That way, the log won’t be pulled underneath during high water, or sag too much during low water. Melting the end of the rope. John first removed the rebar protruding over the edges of the barrel. It was needed to hold the boom chain in place during curing. Now, it would be a hazard during the drop, possibly snagging the rope on the way down. Next, John melted the underwater end of the polypropylene rope with a propane torch to keep it from fraying over time. Knotting the rope to the end of the anchor's boom chain. John knotted the rope around the ring of the boom chain embedded in the anchor. John knows knots. This one will tighten when pressure is applied. He then used waterproof tape to secure the tag end to keep it from floating loose. Moving the raft with the tin boat. Wayne used our tin boat to push the cedar log raft out to the drop location about 45 degrees from the end of the log boom’s corner, and about 50 feet distant. That gave it a good pulling angle to keep the boom in position. John pushing the barrel anchor overboard. Once the drop location was reached, John gave the barrel anchor a shove and it went right to the bottom. Wayne took the raft back to the dock, and returned with just the tin boat. John picked up the floating rope and snugged to the boom log, taking out the slack. He chiseled a notch in the log for a secure attachment, used a log staple to keep the rope in place, wrapped the log three times, and knotted the end. We had some extra rope, so John weighted the end down with a piece of old boom chain. You never know when you might need to make an adjustment. Tying the rope to the ends of the protective boom log. Do you use double-paned windows in your home? They're great for adding insulation, but when they fail, condensation gets inside to clouds the glass, limiting your view. Double-sided adhesive tape in frame. When John built our cabin, he found used double-paned windows. That saved him (and us) a lot of money. But over time, one of the panes in the front window leaked. On the best of days, it was cloudy. Other times, you could see moisture dripping down inside. In with the new pane from Modern Windows. John came out to help us remove the glass. That took a little bit of chiseling and we ended up cracking the pane. But it held together enough to make it to Modern Windows to be measured for replacement. In the meantime, we taped up some plastic to keep the birds (nesting Barn Swallows), wasps (they're starting to hang around), and critters (mice especially) out. In two days, John returned with our replacement glass. The measurements were perfect in both size and pane width. Modern Windows gave John some double-sided tape to use to adhere the window pane to the frame. That was much easier than using a caulking gun. Once the pane was in, John put the outside moulding back on to hold the glass securely in place, and to give it that finished look. Wayne and I've gone on lots of quad trips using our barge, but until recently haven't taken any friends along. 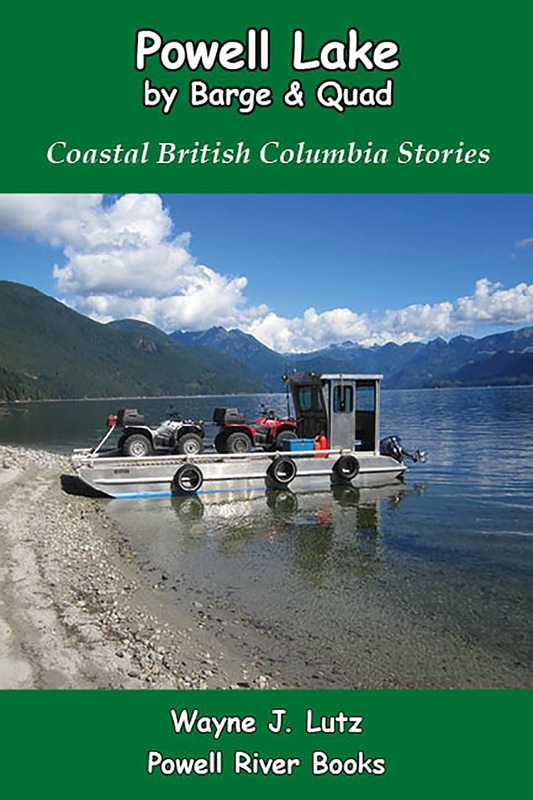 To accommodate a third (a large Yamaha Grizzly), we turned our two smaller Kodiaks sideways and headed south to Mowat Bay to pick up our friends Dave and Marg. Goat Island's Dunn Dock and barge ramp. 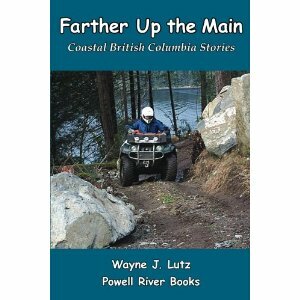 Dave grew up in Powell River and is a past president of the Powell River ATV Club. He and his wife Marg ride frequently, but going to Goat Island in the middle of Powell Lake is a rarity. Wayne and I were glad we could share it them. The last time Wayne and I went to Goat Island, there was active logging just inland from the dock. Large equipment was parked on the road, taking the weekend off. The large forest harvester was the same model Western Forest Products demonstrated last year on the Forestry Tour. Logs blocked our way on old logging roads. It's been a while since Dave was on Goat, but he knew his way around. We headed up Spire Main, and Dave got us to the right logging road to overlook Spire Lake. It was a lot larger than I expected, and a great picnic spot with view. Spire Lake on Goat Island. Wayne pinpointed the two trees we can see from our cabin on his GPS. We got close, but couldn't see through the trees to the ridge overlooking Powell Lake and Hole in the Wall. Maybe future logging will lead us closer, but for now we'll have to be content with our view from below. When I first heard about Becoming Wild by Nikki Van Schyndel (Caitlin Press, 2014), I knew it would be a book I would enjoy. 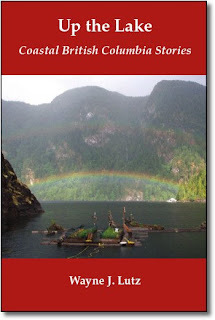 It's a memoir, it's by a woman who challenged herself to live in a remote location, it's about a region fairly close to where I live in Coastal British Columbia, and it includes detailed descriptions of "experiments" and "learnings from Coastal First Nations people" that she used to survive off the grid. 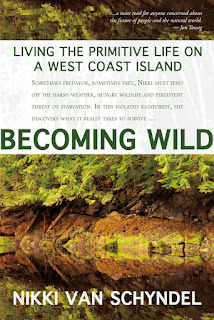 Becoming Wild is available in both print and e-book formats. When I saw it at Village Books in Bellingham while Wayne and I were attending a Whatcom Community College class on independent publishing (we learned that's the "new" term for self publishing), I knew I wanted the print version to save for my personal library about British Columbia. Nikki, Micah (a man she met during survival school), and her feral cat Scout planned and lived a survivalist lifestyle that spanned two island locations and more than a year in the rainforest coast of the Broughton Archipelago. When the trailer at Native Anchorage on Village Island didn't turn out to be liveable, they erected their own primitive shelter. Life that first winter was a struggle just to find enough food. Nikki and Micah had a rowboat they used for transportation, fishing, and to get to Echo Bay on Gilford Island one every month or two to get mail and reconnect with family by phone. After meeting Billy Proctor, a well know resident, they took his suggestion and left Native Anchorage to set up a rustic cabin structure in Booker Lagoon on Broughton Island. Life wasn't easy, but Nikki was able absorb the natural spirituality of the land and sea, ultimately transforming herself into a better person. When the adventure was done, Nikki and Micah parted ways. Nikki and Scout returned to the city, but life there was so foreign after living in nature. 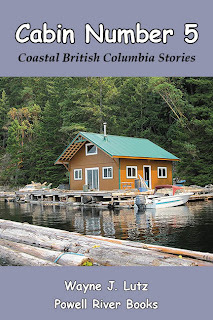 She returned to Echo Bay, bought property from Billy Proctor and built a log cabin of her own. Billy Proctor is a prominent figure in many of the books written about the region. Since the summer of 2002, I've been composting my way to a cliff-side plot of soil using garden waste and kitchen scraps. In 2002, there was no soil in this location, only rocks and a steep slope. I made a simple wire basket that holds our organic waste from spring through fall. My floating garden and deck pots are easy to manage, so I cut everything into small chunks before carrying it up the hill. When fall arrives I dig a pit, dump the freshest trimmings on the bottom, the barrel contents on top, and cover it with soil. In between layers I give it a good watering and use a compost accelerator. The compost pit ready to uncover after "cooking" all winter long. I leave the top exposed through several rains to make sure it's moist. Then it's covered with trash bags and weighted down with boards. The result is more soil for my garden without having to buy it, and without having to carry it up four flights of stairs from the cabin below. Sowing my quinoa seeds after digging my completed compost into the soil. Last year I grew quinoa for the first time. It was a partial success because the critters got to enjoy it more than I did. But I'm giving it another try. This year I sowed lots of seeds in hopes there'll be more for both of us to share. For now, there's plenty of water in the rain barrels. You can bet when it gets hot this summer I'll be praying for rain. Otherwise I'll have to carry buckets up those same four flights of stairs. Now that's not a pleasant thought. Do you grow quinoa? What has your experience been? Living in a float cabin requires some special attention. Our cabin is surrounded by a floating log boom. It designates our water lease from the BC government, protects us from wind waves and boat wakes, and holds my garden in place. John's dog Bro supervises as usual. The southeast corner of the boom is held in place by a heavy anchor connected to the end of the main log by a very long steel cable. The anchor has been in place for fifteen years. It may last another fifteen, but you never know. One thing I do know, if it gives, it will be in the dead of winter during a massive wind storm. Not good, definitely not good! This week John helped us make a new anchor. It started with a 55-gallon plastic barrel, a bag of cement, and a heavy boom chain. We used the tin boat to take our raft to Sandy Beach to get sand (check out the previous post to come along on the ride.) And of course, Powell Lake provided the water to mix the cement. It was a slow process. Wayne dug a bucket of sand. Sandy Beach is a rare spot on Powell Lake that isn't solid rock. Good thing it's nearby. A smaller bucket of cement, a few scoops of water, and John did the mixing. Dump the mix into the barrel and start all over again. In between the cement mix we added medium sized rocks. That was my job, to collect the rocks from along the shore and stack them near the gangplank. The large boom chain was suspended in the middle of the barrel so it would be held firmly in place once the cement set. It'll be the connection point for the new anchor connection. This week we used our tin boat to take our cedar log work raft out on a project. Click on the video below to come along for the ride. The 2452 on the Strait of Georgia on a calm day. This weekend was our first cruise in the Bayliner. She spent the winter in the Powell River Airport hangar and was glad to return to her moorage in the Westview Marina. While she was in storage, we got lots of winter maintenance completed. A fresh coat of bottom paint to keep those sea critters at bay, a cleaned and repainted leg on her engine, new zincs to forestall metal corrosion, and a good cleaning to remove some unexpected rust stains from a steel roof beam in the hangar. We like going to Heriot Bay as a shakedown destination. For that matter, we love going there several times during the cruising season. We stopped at the Heriot Bay Inn for an early dinner on the outside deck. Because it's the shoulder season, we got there too late for fuel. No worries, the anchorage at Rebecca Spit Marine Park in Drew Harbour is right next door. On the last weekend of May, we only had to share the anchorage with four other boats. In summer, this popular spot can draw twenty, thirty, or more cruisers. It may still be spring, but the weather felt like summer. All we did was relax, read, and watch the ducks and gulls swim by. Tower yarder parked on logging road. 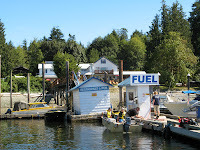 The economy of Powell River and the surrounding region is primarily based on a resources. Logs are extracted for sale to mills down the coast. Pulp is then returned to the Catalyst paper mill, our largest industry. Even though the city of Powell River was founded because of its natural resources, controversy over logging persists, especially when it is in town or other visible areas. Cables from the yarder run down to a tall tree in the slash. But when it's far from town, and hidden in the bush, logging goes on day in and day out. 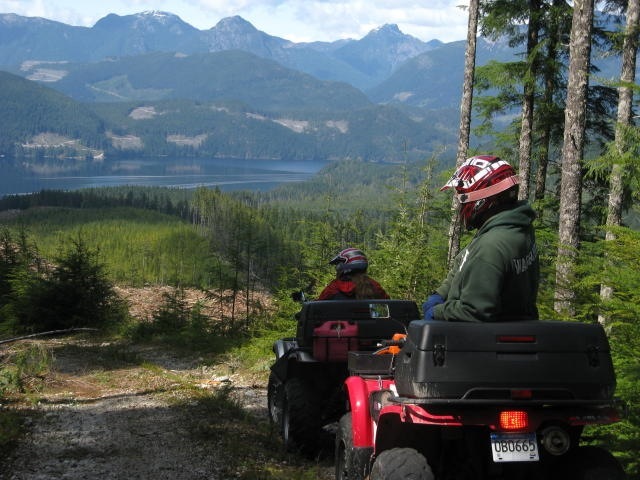 In the Powell Lake area, we have Western Forest Products. They are a responsible logging company and work hard to keep the community informed. Every year they take bus loads of town folk out to their logging area to demonstrate their logging and reforestation practices. On a recent weekend trip to Goat Island with our barge and quads, Wayne and I came upon a fresh cut block with all the equipment parked in place, ready to resume work on Monday. It was really interesting to see everything up close. I'm not an expert at names, but here is what I think we found. Yarder grapple hanging from the cables. The first thing we saw was a tower yarder hooked up for cable logging. Down in the middle of the slash a large spar tree was left in place and supported with guy wires. A cable from the tree ran up to the yarder, allowing it to haul cut logs up to the road for removal. On the ground we found the grapple. Click here for a good description of the process. Next, we came up to a CAT Harvester. This all-in-one piece of heavy equipment can grab a trunk, cut the tree, turn it sideways to strip the limbs, and continue to cut the log into precise lengths. Here's a video I took on the Western Forest Products tour last year. Looking inside the head you could see where the chainsaw was tucked up inside, ready to drop down and cut the tree. Nearby, grinders are placed to take care of stripping off the branches. Loader poised to load logs onto logging trucks. The third piece of equipment we came upon was a loader. After the yarder brought the logs up to the landing next to the logging road, the loader got it stacked and ready for the logging truck to take it down to the log dump at Clover Dock.